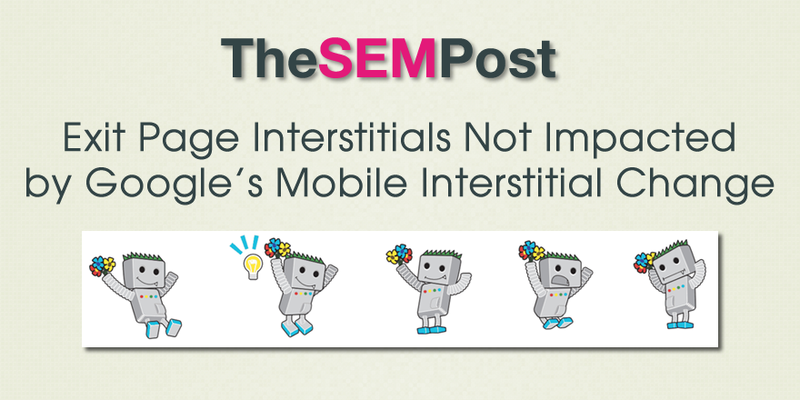 If you have an exit interstitial – an interstitial that only displays once a user tries to leave a site – they won’t be impacted by Google’s upcoming mobile interstitial change which would see pages with interstitials lose their mobile friendly ranking boost. So at the moment, those wouldn’t count. What we are looking for is really interstitials that show up on the interaction between the search click and going to the page and seeing the content. So that’s kind of the place we are looking for those intersititals. What you do afterwards, like if someone clicks on stuff within your website, or closes the tab or something like that, then that’s kind of between you and the user. That said, exit interstitials are seen as pretty scammy by many searchers, since they are essentially hijacking the back button and serving an interstitial instead of allowing the searcher to go back to the search results. And it is also a behavior seem frequently on sites that attempt to download malware too. So any site owner that is considering using an exit interstitial as a way to serve an interstitial without being impacted negatively in the search results will want to consider it from a user experience perspective too. Mueller also said more details will likely be shared once it becomes closer.